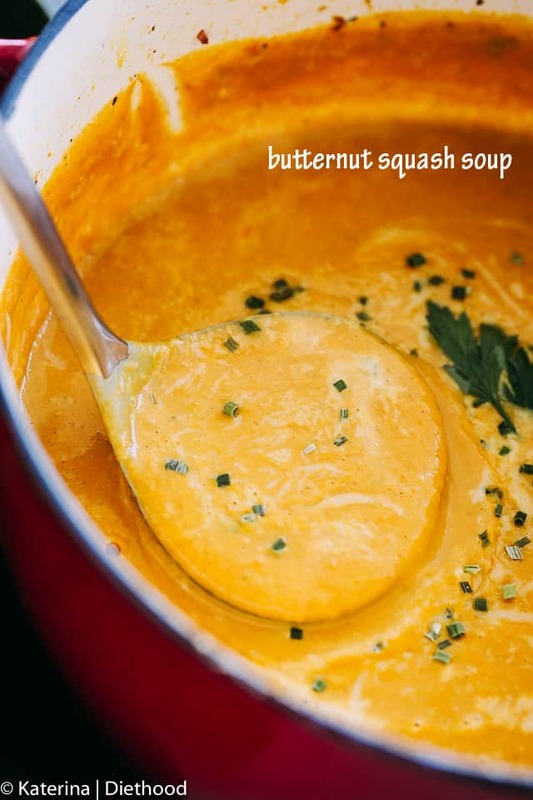 Butternut Squash Soup – Simply the BEST EVER Butternut Squash Soup! You’re just a few ingredients away from this incredibly delicious, comforting, and healthy soup. This recipe was originally published on January 27, 2011, and updated with new photos and content on October 25, 2017. I feel like serving up a big bowl of soup today. Butternut Squash Soup, that is. Lucky YOU! 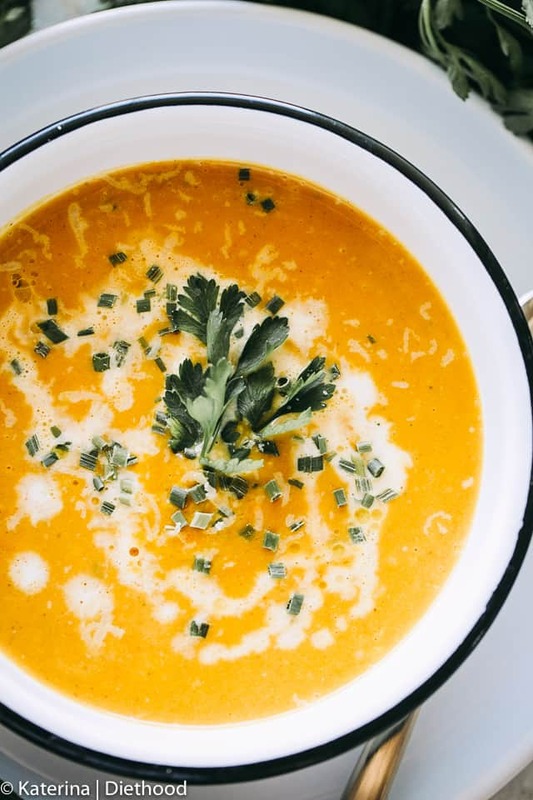 There’s just something about Butternut Squash + Soup in October. Amirite or am I SO right? Trick question – you’d be correct either way. Wazzzz up, my friends?? How about them temps? I’m wet and frozen. I hate going outside, I miss summer, I hate the wind, I miss my flip flops. WAAAAAH! I am keeping calm by reminding myself of Halloween, Thanksgiving, Christmas, and NOT about the cold days in between. Cozying up to that bowl above is also a huge PLUS that comes with the cold seasons. Look at that creaminessssss! And there’s no cream IN it! It’s just the silky, creamy texture of a cooked, blended, and deliciousized butternut squash. 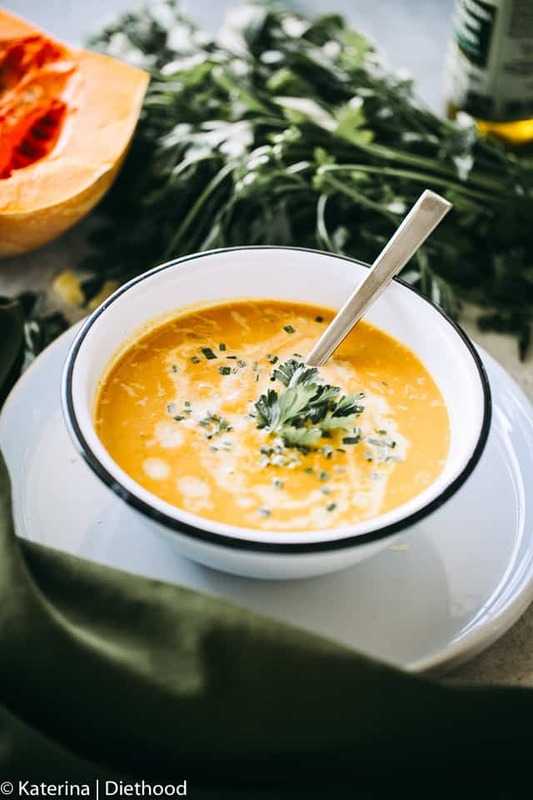 This fall butternut squash soup is straight out of my dreams. It is so absolutely fantastic that I have been dyyyying waiting to share it with you guys. It’s been so hard to keep it a secret because of the incredible flavor this big bowl is going to bring you. It’s unreal. …I also shared this “secret” with you on January 27, 2011, but it’s never too late for a redo! This is honestly so super easy to make. Just cut the butternut squash into a bunch of little 2-inch piece chunks. Throw it into the pot with the good ol’ soup flavah starters – onions, carrots, celery, garlic, parsley, abc, and xyz. You’re going to cook that just until tender – 14ish minutes – throw it in the blender, give it a whirl, get it back in the pot, pour in some milk or half & half, if you like, and boom! Soup is done, just like that. Doesn’t that look so dreamy and cozy? Lovely, isn’t it? Thank you, pal! 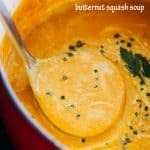 Simply the BEST EVER Butternut Squash Soup! You're just a few ingredients away from this incredibly delicious, comforting, and healthy soup. Heat butter and olive oil in a large pot or dutch oven over medium-high heat. Add cubed butternut squash, carrots, celery, onion, and parsley. Stir in rosemary and thyme; season with salt and pepper and continue to cook, stirring frequently, for about 12 minutes, or until tender. Stir in vegetable broth and bring to a boil; lower heat to medium-low and simmer for 10 minutes. Remove pot from heat and stir in the milk or half & half. Using a blender, purée the soup in batches until smooth. Alternatively, use an immersion blender. Pour soup back into the pot and stir in the nutmeg. Serve garnished chives and parsley. Where does the bacon come in this recipe? There’s bacon in the ingredients list? 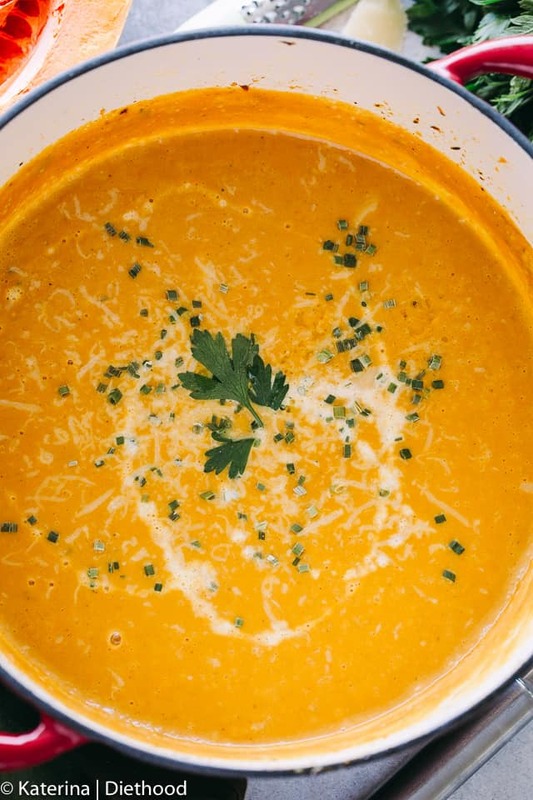 This is our favorite recipe for butternut squash soup!!! I have had family & friends try it and they all agree! Tonight I am going to add some bacon bits for my pickier eaters…. Very happy to know that you enjoyed this soup! Thank you!! Your soup looks fantastic! What is EVOO? Absolutely love it! Had to tweet it! Even in Florida we need a beautifully creamy hearty soup this time of year! Fabulous! I just picked up some butternut squash from our local farmstand from the harvest last fall. Looks like a good way to use some of it! hey ya’ll…you do not have to peel butternut squash (or de-seed for that matter. Just cook it all tender and put into the blender! You may want to run it through a mesh to get out any larger bits but that’s still way easier than peeling and de-seeding! What a cute story! I think we all have stories like this about our rebellious childhood years. I’m sure my children have some about me! Anyway, the soup is fantastic. I love creamy homemade soups like this. They are so much better than the boxed variety. Fresher and with a whole lot less sodium! I’ve been traveling, so I am a bit late, but congrats on making the top 9! Absolutely beautiful photos, Kate! I love butternut squash soup. When it’s well made, it’s really delicious. The roasting is perfect to concentrate flavors and give the soup a slight smokiness…. Yum! The soup looks delicious. The lady in the cafeteria was really awful to report you, while she was not even able to propose meals suitable for people of the same faith as her. I had no idea there existed some fasting on Wednesdays. Yummmmm, I love soups with roasted vegetables, it really intensify all the flavors. Traditions die hard – I often still do meatless Fridays from my youth. But I am meatless 2-3 days a week – just because. I love the story – the cafeteria ladies not knowing what they’re serving, the Dad visiting the cafeteria and bringing your lunch is actually still safer than eating a school lunch! And the soup – sublime! Oh, to be a teen again, NOT 🙂 Loved your story and your gorgeous butternut squash soup. Congrats on the Top 9! Hope you’re having a wonderful weekend, Kate! would love a bowl right now!! Love to read about your teenage. I can imagine how you felt when you saw your dad in the cafeteria. Must be so embarrasing at that age. And I didn’t know about meatless days in Orthodox faith, thanks for informing. As for the soup, it looks fantastic! I love the flavors of celery stalk and garlic accompanying squash. Lovely color too! I love the soup! Butternut squash is my favourite squash..it tastes so smooth and great! I love Butternut Squash soup. Looks amazing and so comforting. Congrats Kate on making once again top 9! You are truly an inspiration, soup look fabulous!! I love this soup! Sounds absolutely fantastic and such a cute story about you and your dad! just gorgeous, presentations and flavors! I’ve never had butternut squash soup! But ‘m dying to try it, especially after reading your recipe! What a great recipe…but I think I enjoyed your story even more. I remember those days of school lunches, and I can imagine how confusing it must have been for you. I’m glad you and your dad found a solution! Thank you for sharing this delicious meal with me! I hope you have a wonderful weekend full of love and joy. Such a hilarious story…I know I would have been mortified! I never knew that Macedonian Orthodox went meatless twice a week…so interesting. Your soup looks perfect for this snowy winter…and we’ll be going meatless on Fridays once Lent arrives. Yum! I could eat this delicious soup every day of the week! LOL, I really like your story of that rebellious phase you went through at high school. Luckily for your parents, it was only to do with food…I mean, it could’ve been much worse! Your soup looks delicious and I definitely would like the bacon slices too!! Soup look wonderful and I love the color! I could not go through my dad’s Orthodox tradition. I have a cousin just like you, always fasting! Hearty soups such as this could turn me into a vegetarian any day!! Looks yummyyy!! Mmmm! A rich squash soup is just so wonderful! I like your addition of the bacon atop! Tasty! Pretty presentation, too! Thank you! 🙂 Leave the bacon out, but I would keep the sauteed green onions… yum! This looks so inviting ad delicious. I’ve been on a soup kick lately and will have to try this soon! This weather just screams for soup. What a tough thing to have to figure out on your own as a kid. I couldn’t have done it. I also have to admit that I’d be like your husband and add the bacon. 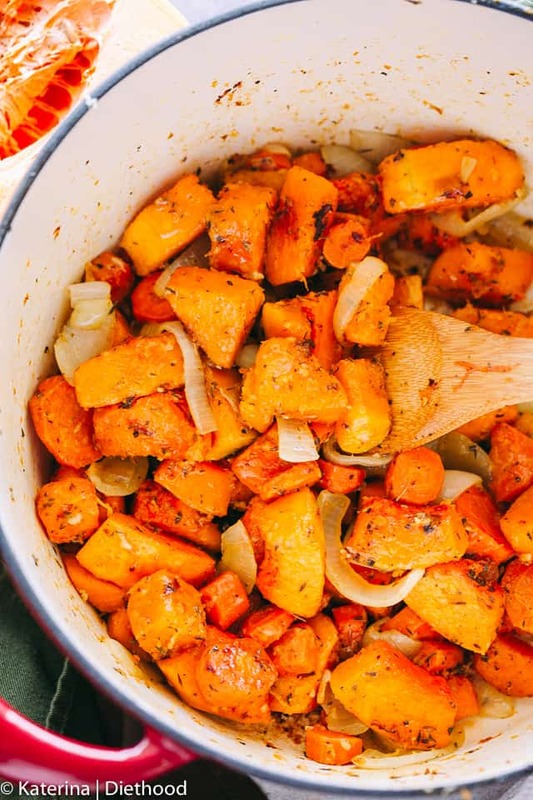 While bacon makes everything taste good, it goes incredibly well with butternut squash. It really sucked because you don’t want to mess up but then you’re embarrassed to keep asking the same questions all the time. What a delicious looking soup! It’s very cold here in Chicago and this is definitely a soup that is perfect for this weather! My mother is a Bulgarian Orthodox, so I guess it’s just something she never did and that’s why I never knew about it… She doesn’t eat meat for a certain time before Christmas though… oh well, I guess I should start reading on the subject 🙂 It’s great to learn interesting (and important!) things like this along with good recipes! Ha! Love the story! I guess we’ve all be busted by our parents for something! The soup looks great! I’ll hold the bacon and yogurt 😉 I usually saute the veggies for squash soup — love the idea of roasting them! I love the taste of roasted veggies and the roasted squash caramelizes giving the soup that extra depth of flavor. It’s delicious with or without the bacon and yogurt. O, indeed! Wednesday and Fridays, 6 weeks before Christmas, 7 weeks before Easter, 2 weeks before St. Mary’s Day and 2 weeks before St. Peter & Paul. But now we are trained in healthy, veggie food !!! Great post and super-super soup!